Table linen There are 115 products. Placemat 40x50 cm, 100% cotton. 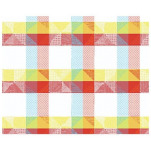 Colors: orange, white, yellow, green, blue and red. Quality finishes with standard 15mm hems. Wash separately at 40 ° C before use. A stain encrusted more easily on a non pre washed laundry. Machine wash at 40 or 60 ° C maximum color with a detergent for colored laundry. Drying at moderate temperature. Iron on very hot iron. Placemat 40x50 cm, 100% cotton. 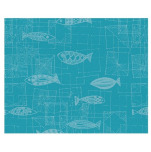 White fish on a turquoise background. Quality finishes with standard 10 mm hems. Wash separately at 40 ° C before use. A stain encrusted more easily on a non pre washed laundry. Machine wash at 40 or 60 ° C maximum color with a detergent for colored laundry. Drying at moderate temperature. Iron on very hot iron. Blue doily, galaxy, 20 cm diameter round, embroidered, 65% Polyester and 35% Cotton, Sander. Green doily, galaxy, 20 cm diameter round, embroidered, 65% Polyester and 35% Cotton, Sander. 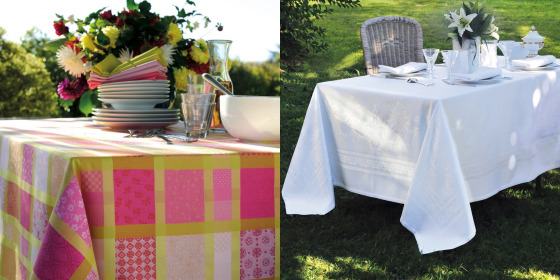 Jacquard tablecloth 160x250 cm Brindille 100% cotton. 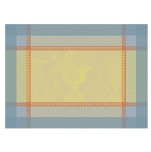 Colors of the 2 colors tablecloth : porcelain blue, yellow, orange and white. 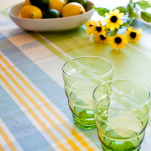 Colors of the 4 colors tablecloth: apple green, light green, light blue, yellow and white. 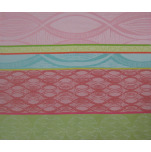 Color of the 24 colors tablecloth: turquoise, light blue, white, light green and medium green. 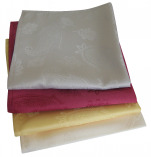 Napkin 45x45 cm Indira 100% polyester. 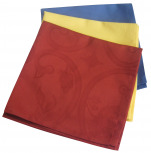 Napkin 46x46 cm Tocade, 50% cotton and 50% polyester.